Former Defense Secretary: North Korea's End Game Could Be a "Hail Mary" Nuke on the U.S.
Subject: Former Defense Secretary: North Korea's End Game Could Be a "Hail Mary" Nuke on the U.S.
At a Washington, D.C., panel on North Korea's nuclear threats this past Wednesday (June 14), one sentence uttered by former Defense Sec. William Perry rendered many in attendance perceptibly shaken. 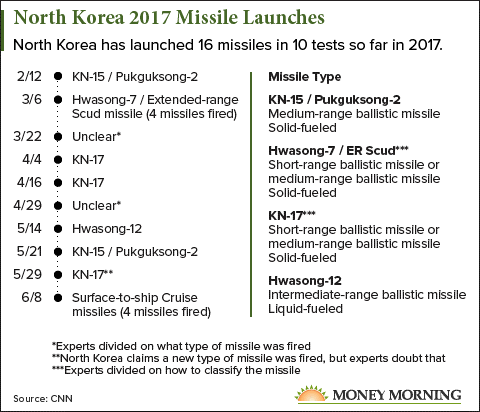 In response to the moderator's question – "Should the U.S. pre-emptively strike North Korea?" 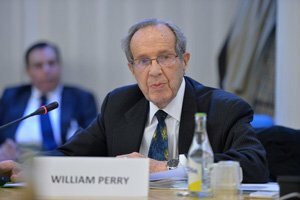 – Perry said, "We don't want to engage in traditional warfare with Pyongyang because North Korea's end game could very well be a 'Hail Mary' nuclear bomb launched at the U.S."
While those of us in the audience absorbed Perry's claim with wide-eyed concern, the other two experts on the panel – former Sen. Richard Lugar (R-IN), one-time chairman of the Senate Foreign Relations Committee under President Bush, and Michael Auslin, Asian regional security specialist at the American Enterprise Institute (AEI) – simply nodded in agreement with the defense secretary. And in an effort to exude some semblance of composure myself, I tried to look just as coolly aware. In reality, I was taken aback. Not by the idea of a "North Korean end game" (which sounded like a blockbuster movie description to me), but by the former defense secretary's sincere concern that Pyongyang could one day launch a "Hail Mary" nuke over the Pacific Ocean. "If the Pentagon and military decide to strike North Korea first," Perry said, "then North Korea will turn around and bomb South Korea." "[A North Korean attack on South Korea] would then lead to the start of a bigger, broader global war," Perry said. It was at this point the former defense secretary admitted that he's not quite sure what, precisely, would happen next. "I just don't know," he said, "But China, Russia, Japan – they'd get involved. The Middle East could even get involved." Should a messy melee between heavily armed nations break out with Pyongyang in the center of the action, North Korea would be destroyed. "North Korea won't survive a large-scale war in the region," said Perry. "And North Korea knows that. But they'd certainly go down fighting." Which brings us back to that "Hermit Dynasty special delivery" for the United States: a "Hail Mary" nuclear bomb tossed our way as Pyongyang burns to a crisp. Perry's nuclear scenario is obviously worrisome. But what's helpful to know is though war is hell, it's not for the stock market. You don't have to take your money and bury it in the backyard to financially survive what could happen with North Korea. As Barron's pointed out in an April 2017 report, in each one of these conflicts, the Dow fell an average of 0.6% just before the fighting started. A month later, however, the Dow soared an average 4.0% – 3.2 percentage points greater than the average of all of those months since 1983. For extra help in preparing your financial future for what's next, check out Money Morning's exclusive subscription service, Private Briefing — written by our Executive Editor William Patalon, III. Bill has been covering developments in the "Asian Arms Race" for three decades. And he takes potential military conflict warnings a step further by adding actionable recommendations to them. One such profit recommendation he's given readers – that's up 170% since he first told them about it in 2011 – is Boeing Co. (NYSE: BA). Bill knows that if (or when, rather) there is a war, Boeing will be there. Currently, the aerospace manufacturing company contributes to several military projects overseas and at home – the THAAD and GMD defense systems, for example.